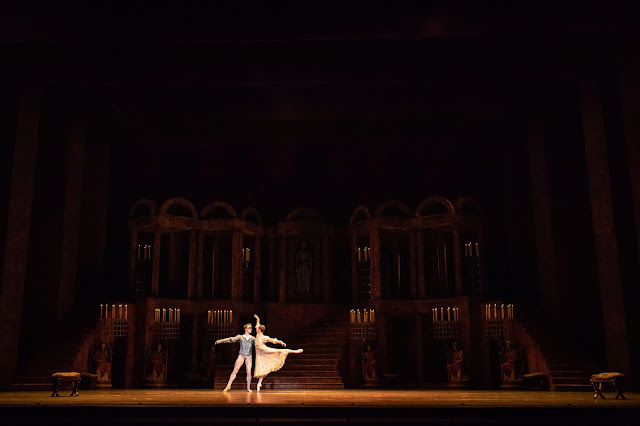 Romeo and Juliet is arguably Shakespeare's most well known play and a regular feature in the Royal Opera House programming, having been performed by The Royal Ballet more than 400 times since its Covent Garden premiere in 1965. This season beautifully revives Kenneth MacMillan's dramatic monument in a smooth and moving way, with a number of Company debuts making it feel fresh even after all these years. In the title roles, Matthew Ball and Lauren Cuthbertson are a match made in heaven as they bounce off of one another, in their sweetly romantic choreography which showcases young love (and obsession) especially well. The tension as they build to their first kiss is palpable. Romeo lifts his Juliet onto pointe as they kiss and creates a very calm and heartwarming moment before the fast paced drama of the next two acts. Ball and Cuthbertson are masters of their craft and give performances which completely justify their successes. Act One drags a little but the pageantry from the offset is marvellous. The sword fights are choreographed memorably and sharply and stand out against Nicholas Georgiadis' set as they fill the vast stage. The contrast between the intimate pas de duex and large scale ensemble numbers does well to bring variety and allows moments of extreme action as opposed to storytelling alone. A particular stand out is certainly Marcelino Sambe who leads the mandolin dance perfectly and creates a buzz as the audience are drawn in by his fantastic technique and performance skills. Itziar Mendizabal also shines as she brings brief moments of humour and light to the three harlots who appear throughout. The melodrama is prevalent, with Mercutio's death (Valentino Zucchetti) and Lady Capulet's break down providing emotionally impactful moments. Mime is used perfectly by the pair as well as by Cuthbertson who acts beautifully throughout. Brief moments where dancers fell out of time are noticeable but do little to detract from the story and flow. Whilst MacMillan's choreography does everything it should, there are times when it feels too much is being done in too little time, and there isn't a second to really appreciate the intricacies of the basics. The musicality of movements feels undervalued in comparison with storytelling. MacMillan's telling really puts Juliet at the heart of the story which brings a fragility and power that makes it so special. A wonderfully danced and highly luxurious production, Romeo and Juliet is sure to delight audiences. Romeo and Juliet runs at the Royal Opera House until 11th June 2019 and will also be screened at cinemas on the 11th.